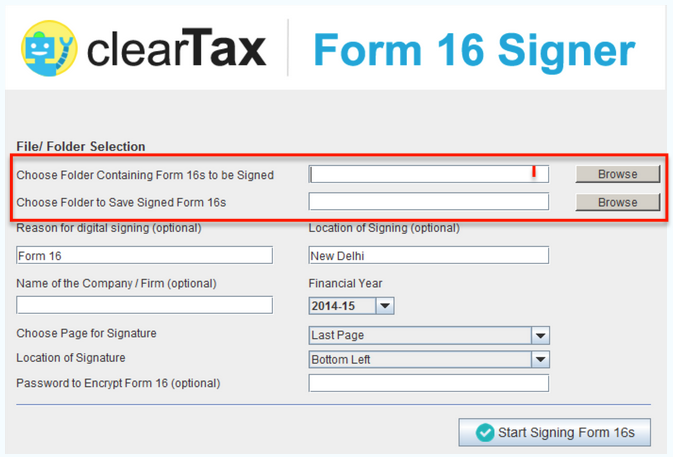 Please read the following guide to understand how to generate, sign and merge Form-16s using the software. If you would like to generate Form-16 Part-A, you can use our software to generate the Part A directly. 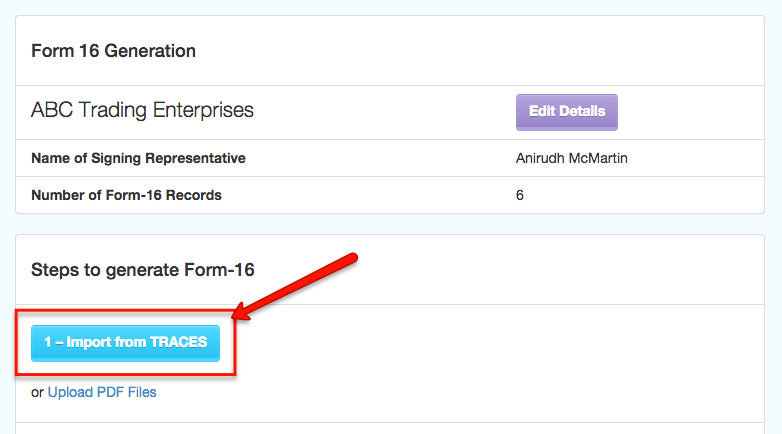 First, simply request for the Form-16 Part-A on the TRACES website. This file is a .zip file. Please unzip the file and extract the .txt file on your desktop. Our software will automatically convert this requested download to PDF for you! If you are already a user of ClearTax's Free Cloud based e-TDS Return Software and used it to prepare your TDS return you can directly create Form-16 along with your TDS Salary Annexure. You can use ClearTDS to create the Form-16 Part-B even if you had not generated the original return using TaxCloud! Click on the button "2 - Import from Excel". Simply download the Form-16 Excel Template provided and fill in details about the salary for each employee. Just upload the file, and we will import all the details for you. The Excel file has a second optional sheet you can fill up if you also want to generate Form 12BA / Salary Annexure for your employees. 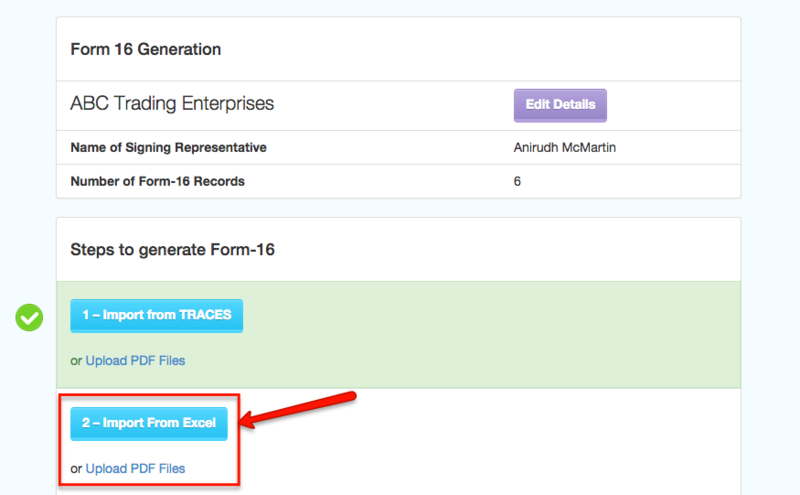 Once you upload this excel file, you can now proceed towards preparing your Form-16. The software automatically merges the Part A & Part B PDF files and gives you a single combined PDF for each employee. Click on the button "3 - Generate Form 16"
You can now download the Form-16 PDF files directly. ClearTDS provides you with a free digital signature software that can be used to sign the PDF files with your USB Token. This Digital Signing software will work will all types of USB tokens: Alladin, e-Pass, Trustkey, e-Pass2 etc. Click here to download the free digital signature software. Double click to install and after installation, please start the application. Make sure the USB token has been inserted into your USB port and all the drivers required for it are installed. For signing, the software will import all the PDFs from a specific folder and export the digitally signed version into another folder. Mark the location of the input and output (source and destination folders) in the application. You can sign any Form-16 with this utility (even PDFs not generated using TaxCloud). TaxCloud will automatically merge the PDF files you had uploaded with the Part B! TaxCloud will automatically generate the Part-A and merge it with your Part-B PDF file for you. Even if you have both Part-A and Part-B PDF files, you can simply upload them to TaxCloud and the software will merge the files and give you a combined PDF for each employee.